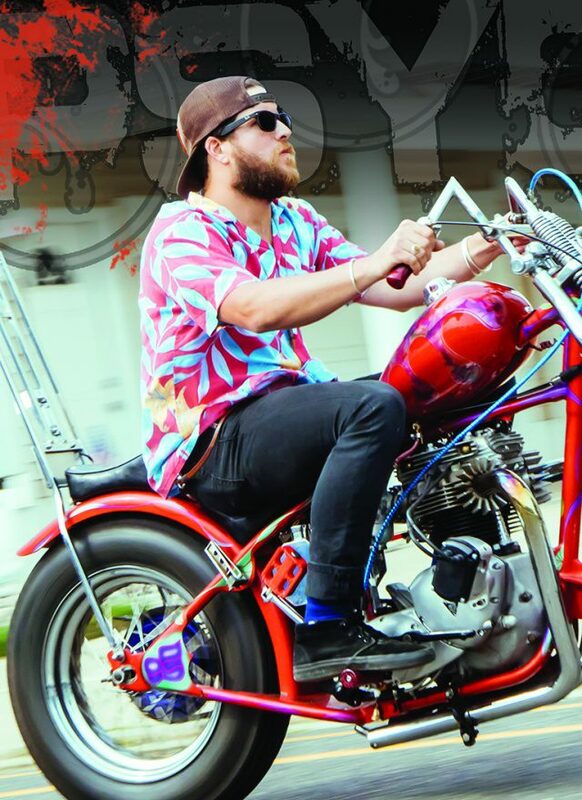 Kendall Keer out of Point Pleasant Beach, NJ was working on building a Sportster and collecting parts when he decided to check out a swap meet in Pennsylvania. While there, he ran across a Triumph survivor frame complete with vintage paint, tank, fender, and seat. After mulling it over, Kendall decided to pass it up. Problem was, he couldn’t get it out of his mind all week. Eventually his buddy Chris talked him into trying to fi nd and purchase the frame. Deciding he needed to grab it meant trying to locate it, which with a little investigative work on Craigslist he managed to make it all happen. Turns out the frame was further away than the location of the swap and the only day Kendall could pick it up was the same morning he was heading out of town for a different reason. Not to be deterred and with his father in tow, they drove out early in the morning to Doylestown PA to pick up his score, then Kendall continue on to Vermont. It was completely worth it! Once home, Kendall realized that the frame has been untouched since it was last registered in 1975 for the state of PA assuming after the custom build. It even has the special construction plate riveted on the front headlight mount and an inspection sticker plate from 1980 marking its last time on the road. Initially, Keer decided to bring the bike back to what it may have been before it was stored for all those years. He had seen one very poor quality photo of the bike before it was parked in a shed. Ultimately Kendall decided he would get more joy from preserving the frame and building his interpretation of a chopper. He did not need to hurry the build and knew that he could take his time to complete the project over the next few years. 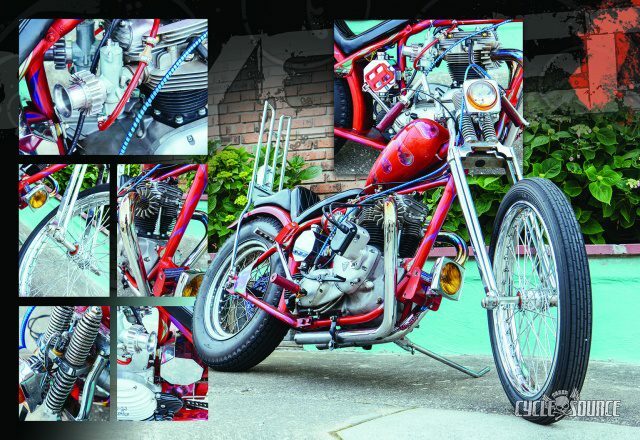 One of the most apparent deviations, as indicated by the frame, is the installation of a 1965 Triumph T120 Bonneville motor built by Classic Cycles LTD out of Frenchtown NJ. Clearance was a massive issue for the engine. Later Triumph heads are half an inch higher, so it was kind of a pain to fi gure out since it was an early sixties front loop. Kendall used a Webco Oiler on the rockers, and the fi ns really pulled the top end together and goes well with the Maund Speed velocity stacks. The oil fi lter that sits at the bottom of the seat post was made in England adding further character. Kendall originally had a ten over Girder on the chopper but changed it over to a springer obtained from friend Marty, which gave it a better ride. 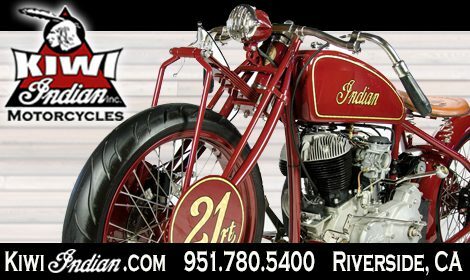 Having been in the scene for several years, Kendall loved the idea of working, designing, and building any parts the motorcycle may require. This would be his fi rst frame up build, so Keer was new to making certain things from scratch. He found it more a of a challenge since the frame was technically complete. Some of the unique items were the footrest, upper front headlight mount, and his friend Chris’s coffi n tail light that was handmade by welding aluminum in his shop. They also reworked the sissy bar which is an AEE found at a swap with really bad supports welded on that were twelve inches too short. Kendall felt it fi t the bike perfectly, adding to the graveyard scene painted on the rear fender. The lower exhaust mounts presented a problem since there were no spots available. Kendall used ‘P’ clamps and fabricated mounts that lined up with the lower motor mount to secure the exhaust. About two weeks before the Cheap Thrills show in NJ they were scrambling to fi nish when Kendall fi gured out the magneto hardware was the wrong size. A call out to Joe Hunt meant they were hooked up with the right parts and back on track to meet the newly imposed deadline! 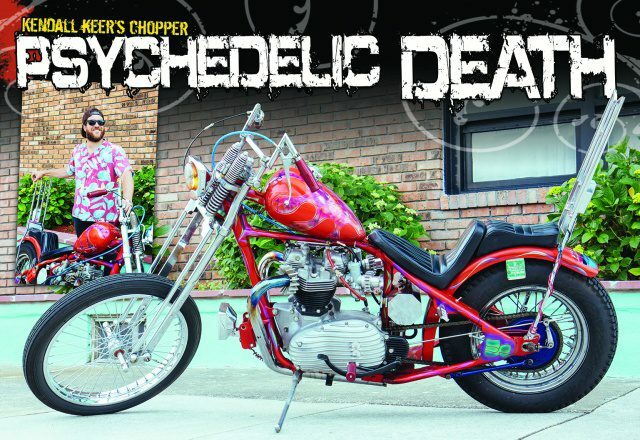 All the time spent with friends and others he met along the way to complete the build paid off as the chopper took the award for “Best British.” The bike turned out a little sweeter then Kendall was expecting, as he was not intending a show bike but quickly realized this was indeed a head turner. The motorcycle rides amazingly well, built to be ridden, and feels great which is all that mattered to him. Kendall hopes at some point to discover more history on the frame and particularly who painted it! Contact Cycle Source if you happen to have info! 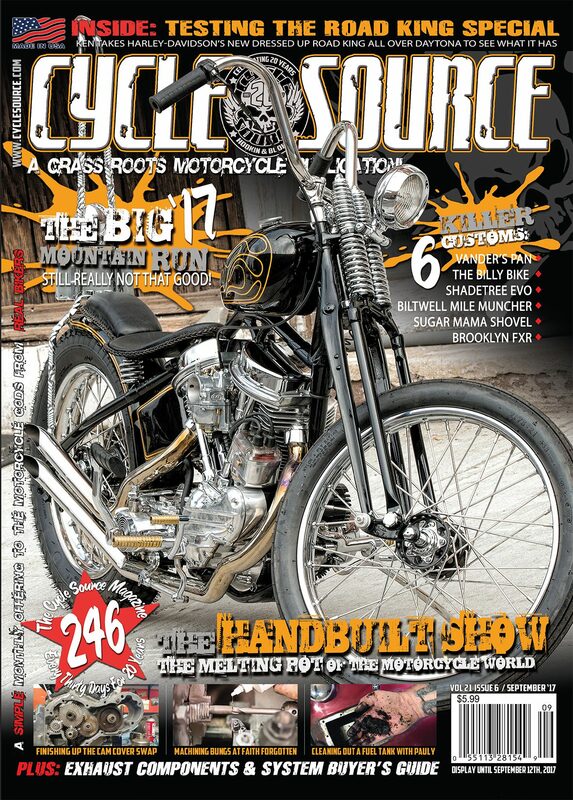 This entry was posted in Feature Bikes and tagged Back Issue, custom bikes, Cycle Source, Cycle Source Magazine, Feature bike, November 2018, Psychedelic Death, T120 Bonneville, Triumph, Triumph T120. Bookmark the permalink.